Stylish, functional and equipped with no less than 13 different settings, including a gluten free option, this stainless steel, 650W Digital Bread Maker lets you have your bread any way you like it. Just add your ingredients, select your desired program and in less than an hour, you will have a fragrant and tasty loaf to savour! The easy to use, 13-hour programmable timer and one-hour keep-warm function even allows you to plan ahead, making this appliance the perfect companion for busy professionals or parents. Used my bread maker 3 times and the bread turned out lovely every time, tried 2 different settings both did what they should and with the number of settings there is bread for everybody. Pricewise a bit cheaper than my last bread maker but a lot cheaper than some and it definitely better than my last one. Very pleased with my bread maker. Stylish looking, easy to use and clean, very quiet even during the kneading cycle and very competitively priced. Bakes lovely bread, would not hesitate to recommend. this is the best bread machine to use with simple easy to use instructions and uses bread packs which are easy to use with just add water and turns out a really good loaf of bread and the aroma of bread cooking is lush. HAVE USED THIS ON NUMEROUS OCCASIONS SINCE RECEIVING IT ON SATURDAY, MY HUSBAND MADE WHITE BREAD FOR US AND MY DAUGHTERS FAMILY, ALSO MADE WHOLEMEAL BREAD FOR US, VERY EASY TO USE AND FOLLOW THE INSTRUCTIONS. GOOD VALUE FOR MONEY, AND SO EASY TO CLEAN. BUT BREAD DOES STICK TO PADDLE AND MAKES IT HARD TO REMOVE FROM BREAD. I have not used my bread maker as of yet, but I wil, because I like all tower products, and I know from past experience from the products I have bought in the past, I know it's going to work perfect. I've made 2 lovely loaves so far, a basic white and a cheese and onion and they've both turned out really well...so much better than my old breadmaker (a different make). Very pleased. The only criticism is the same as mentioned in other reviews, that the instruction book could be better. The recipes are fine but I don't feel there is enough clear information on actual operation of the machine, which buttons to choose for different settings. Overall though, I'm extremely pleased with the breadmaker. Great value for money. Broke down after a few months,I asked for a warranty but Tower send me back to the seller.I think its lost money. I bought the Tower bread maker as replacement for an older bread maker. My old bread maker was complicated to use and bread took hours to make. The Tower has easy to follow instructions, and makes excellent bread. It is well made and looks good. It is also reasonably priced. Good Product. The Cooking tin and paddle look identical to the Panasonic. It has lots of features and makes a good light loaf. \n\nThe base on mine is not flat and I had to chase it up the worktop and bung a wedge under it to leve it up.\n\nThe instructions need to have a bit of a revirew as they give the loaf size in Grams and the machine settings are in Imperial. I had to convert a 750g instruction to lbs..
Good Product. The Cooking tin and paddle look identical to the Panasonic. It has lots of features and makes a good light loaf. The base on mine is not flat and I had to chase it up the worktop and bung a wedge under it to leve it up. The instructions need to have a bit of a revirew as they give the loaf size in Grams and the machine settings are in Imperial. I had to convert a 750g instruction to lbs.. Delighted with my Breadmaker. I bought to replace an old Murphy Richards one and can't believe the difference. First of all looks great and takes up less room. Have used for a variety of recipes and haven't made a bad one yet. You can make three different sizes of bread which all come out in a regular loaf shape rather than my older square one. Excellent value for money and I definitely made the right choice. Sun dried tomato bread my favourite. its a easy bread maker. plus its a compact size. Good price.Lots of good programs. Chosen for the gluten free option. Looks good, and compact. When doing a bigger loaf it does move across the worktop occasionally so wouldn't want to leave it unattended. Never had one before so cannot say how it compares to another. Excellent bread machine. Makes great, tasty bread. Easy to use. Machine looks as good as it cooks. Well made, quality product. Highly recommend. I have never baked anything at all in my life but I wanted to bake my own bread, So I looked around for a breadmaker as I had read about others using them at home.\n\nI wanted a good range of features with great build quality but it also needed to be value for money as I have to live n a budget, I found others that were too expensive for me but this one ticked all of my boxes.\n\nThe build quality is great, it looks stunning in my kitchen and it really is very easy to use. Just follow the provided recipe and you'll be eating delicious home baked bread in no time. I was very surprised at how economic it is to run, although it takes over three hours to completion, the unit only uses power for a short amount of time when actually baking or kneading the dough, the rest of the time it sits idle allowing the dough to rise.\n\nThe resulting bread was fantastic and I am so pleased I bought the unit. I wouldn't hesitate to buy another, and would trust Tower to tick all my boxes once again. I have never baked anything at all in my life but I wanted to bake my own bread, So I looked around for a breadmaker as I had read about others using them at home. I wanted a good range of features with great build quality but it also needed to be value for money as I have to live n a budget, I found others that were too expensive for me but this one ticked all of my boxes. The build quality is great, it looks stunning in my kitchen and it really is very easy to use. Just follow the provided recipe and you'll be eating delicious home baked bread in no time. I was very surprised at how economic it is to run, although it takes over three hours to completion, the unit only uses power for a short amount of time when actually baking or kneading the dough, the rest of the time it sits idle allowing the dough to rise. The resulting bread was fantastic and I am so pleased I bought the unit. I wouldn't hesitate to buy another, and would trust Tower to tick all my boxes once again. I have recently purchased this breadmaker in an endeavour to make palatable bread for our son who Ian a coeliac sufferer. I have so far given it a trial run with wholemeal flour on two occasions and found the bread satisfactory although my first attempt produced a sunk in top but the bread was tasty if not too good looking! My second loaf I made with the same recipe but reduced the water as this was indicated on the faults section to be a likely cause of my sinking top...yes this seemed to work to a fair degree and the second loaf we much more aesthetically pleasing. Obviously trial and error until I get more acquainted with the machine. I hae now received my order of gluten free bread flour so will make my first loaf later this week when my son comes over. Unfortunately I can't pre-empt the outcome at the moment. Three loaves so far. All successful. Much better loaf shape than other bread makers I have used. I like the way the pan locks into the machine. Happy with it so far. Ordered through tesco direct after looking specifically for a silver breadmaker to match other worktop appliances. Well priced, nice compact design and easy to use. Also shorter than my two previous Morphy Richard Fastbake models so takes up less worktop space and easier to see the controls. Only downside is that the mixing paddle doesn't fold down before the baking stage so leaves a large hole right in the centre of the bread base. Perhaps Tower could devise a folding paddle like Morphy Richards have in their Fastbake model?? This is a great bread maker' so easy to use I've had three & this is the best one so far. Try different type of bread each one has come out lovely . I have been making my own gluten-free bread, using a special recipe containing a mixture of flours for the last 26 years. The mixture was done using a Kenwood Chef and the process needed plenty of time to add and mix the ingredients and then allow time for the bread to rise before putting it in the oven.\n\nWith this new bread maker everything is so easy and simple and the loaves I have made are so much better in consistency and much less crumbly. It is so easy to add the ingredients and then to leave it to the machine to make the bread. I am delighted with the results. I have been making my own gluten-free bread, using a special recipe containing a mixture of flours for the last 26 years. The mixture was done using a Kenwood Chef and the process needed plenty of time to add and mix the ingredients and then allow time for the bread to rise before putting it in the oven. With this new bread maker everything is so easy and simple and the loaves I have made are so much better in consistency and much less crumbly. It is so easy to add the ingredients and then to leave it to the machine to make the bread. I am delighted with the results. Have been using this machine for the past couple of weeks. Easy to use & the delay timer is great. Waking up to the smell of new baked bread starts the day well. Good size & does not take up a lot of space on the worktop. Needed a bread machine with a gluten free option for my daughter, so ordered the Tower one. So glad I did, works a treat. Lots of options, all easy to program. Usually put it on timer so we have fresh in the morning - delicious! Cleaning a doodle, well made, very pleased. Very good machine.My only complaint is the lack of a recipe book.However using\nrecipes from a previous,now defunct ,breadmaker,it made an excellent loaf.and\nI am very pleased with my purchase. 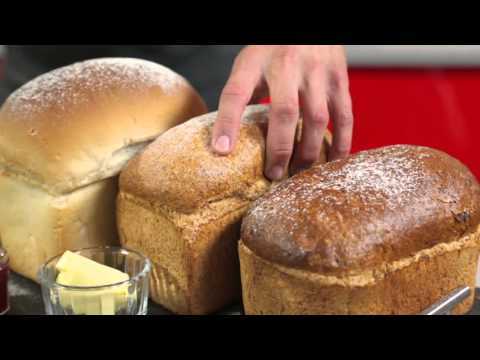 Breadmaking made simple. I needed a breadmaker with a gluten free setting and cannot believe the simplicity of this machine. Simple instructions, just add in the correct order, shut the lid and return two hpurs or so later for fresh bread. Brilliant. Wish I had found this sooner. Has been brilliant so far, have made lots of bread ( packet breadmix works best and is so easy), and also Jam in it. Unfortunately the instruction book dosent have a recipe for jam in it, even though it has a jam setting, and it would all be much better if the instruction/recipe book was written by someone who actually used a bread machine, it could be improved so much! Otherwise it's fine. Had to return breadmaker back as it was faulty. What a good Christmas present!! We are very pleased with the bread we are making however, we have come across a big problem. If you follow the complete procedure through to the end of the cycle, when you try to remove the loaf it is extremely difficult to remove it from the cooking pot because the paddle is embedded in the bottom of the loaf and when you do then take the paddle out there is a big hole in the shape of the paddle. This obviously causes problems on slicing near the middle of the loaf. We phoned customer services who couldn't really offer any advice. However, what we have tried is to remove the kneaded mixture before the final rise, the paddle can then be easily removed and the mixture returned to the pan for final rise and cooking, but surely this defeats the object of an easy complete cycle. After cooking, the loaf easily tips out of the pan and all that you have on the bottom is a very small round hole. We feel that there is a possible design fault which leaves the paddle stuck in the bottom of the loaf.\n\nPlease advise what we are doing wrong. We look forward to hearing from you. What a good Christmas present!! We are very pleased with the bread we are making however, we have come across a big problem. If you follow the complete procedure through to the end of the cycle, when you try to remove the loaf it is extremely difficult to remove it from the cooking pot because the paddle is embedded in the bottom of the loaf and when you do then take the paddle out there is a big hole in the shape of the paddle. This obviously causes problems on slicing near the middle of the loaf. We phoned customer services who couldn't really offer any advice. However, what we have tried is to remove the kneaded mixture before the final rise, the paddle can then be easily removed and the mixture returned to the pan for final rise and cooking, but surely this defeats the object of an easy complete cycle. After cooking, the loaf easily tips out of the pan and all that you have on the bottom is a very small round hole. We feel that there is a possible design fault which leaves the paddle stuck in the bottom of the loaf. Please advise what we are doing wrong. We look forward to hearing from you. Havant done a lot of bread yet, but was surprised at how easy it was. Still playing and enjoying! Excellent product delivered quickly and efficiently and also very competitively priced, it is a christmas present for my son, he will be delighted.\nWell done Tower, my 4th order, just as good as the other 3 ! Bread making made easy what more can I say.